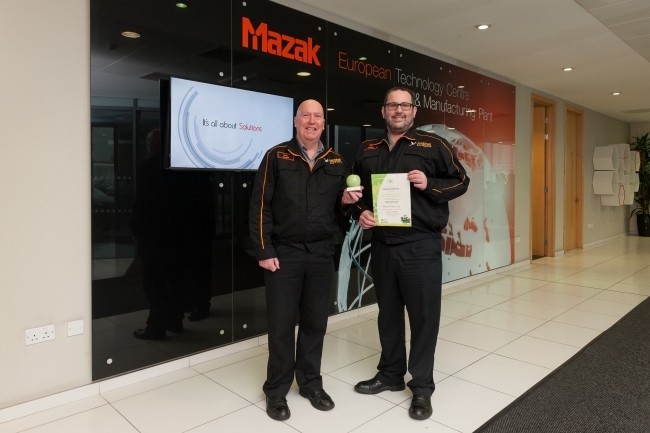 Yamazaki Mazak UK has announced it has won the SILVER Environment Award at The International Green Apple Awards, for its efforts to reduce single use plastic cups at its European Manufacturing Plant in Worcester. The national campaign by The Green Organisation recognises and rewards the greenest individuals, companies, councils and communities in the country, and winners were announced this month at a ceremony hosted by Liz Kendall MP at the Houses of Parliament. Mazak competed against more than 800 other nominations in the Environmental Best Practice category, but its project, ‘Reduce & Remove Single Use Plastic Cups’, stood out. Historically, the factory was using 8,000 disposable cups per month, but thanks to the efforts of Mazak’s Environment Team, this has been significantly reduced. Following the Green Apple Award success, Mazak has been invited to have its winning paper published in The Green Book, the leading international work on environmental best practice. In addition, there is potential for the company to progress to represent the country in the Green World Awards 2019 and have 100 trees planted in its name as part of the United Nations Billion Trees initiative. The Green Apple Awards began in 1994 and have become established as the country’s major recognition for environmental endeavour among companies, councils, communities and countries. The awards are organised by The Green Organisation – an international, independent, non-political, non-profit environment group dedicated to recognising, rewarding and promoting environmental best practice around the world. The awards are supported by the Environment Agency, the Chartered Institute of Environmental Health, the Chartered Institution for Wastes Management, REHIS and other independent bodies.